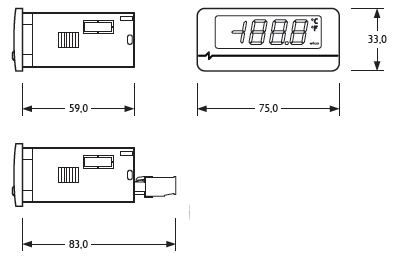 EVK100 is an universal configurable digital thermometer able to work in a working range between -100 and 1300 °C. The possibility of active transducers connection as measure input (0/4-20mA or 0/2-10V) allows to use the instrument also for relative humidity, pressure or some more quantities. Thanks to availability of models with universal measure input (for PTC, NTC, Pt100/Pt1000/Ni 120 both 2 and 3 wires probes, J/K thermocouples, 0/4-20mA or 0/2-10V transducers), to the availability of different power supply and to temperature reading scale configuration (°C or °F), these controllers can be defined "universal reading devices". Instrument configuration is possibile only by using EVKEY programming key. Panel cut out: 71 x 29 mm. Power supply: 230 VAC, 115 VAC, 12-24 VAC/DC or 12 VAC/DC; 50/60 Hz. transducers for "dedicated" models; 1 universal for PTC, NTC, Pt 100 / Pt1000/ Ni120 2/3 wires, Tc "J"/"K", 0/4-20mA and 0/2-10V for "universal" models. Ni120 2/3 wires: -80 / 300 °C.